I’ll let you fill in the blank. July 3 is National Eat Beans Day! Beans are one of the oldest cultivated plants in human history. They were grown for thousands of years B.C., and even predate ceramic pottery – meaning ancient people were cooking beans before they had anything to eat beans out of. They were an important source of protein since waaaay before the Dark Ages, and remain so to this day. The most common edible bean, of the genus Phaseolus, is native to America; several varieties were domesticated before Christopher Columbus ever landed on these shores. Native Americans practiced the “three sisters” method of agricultural cultivation, planting maize, squash, and beans in the same place, utilizing natural resources in an environmentally responsible way. Al Gore would be proud. Beans are a heliotropic plant, meaning the leaves turn toward the sun during the day, and then fold up at night. As for the old children’s rhyme, many beans contain oligosaccharides, sugar molecules that are also found in cabbage. The human digestive tract does not have any anti-oligosaccharides enzymes, crucial for properly digesting these molecules, so bacteria in the large intestine feast on them instead. The result? 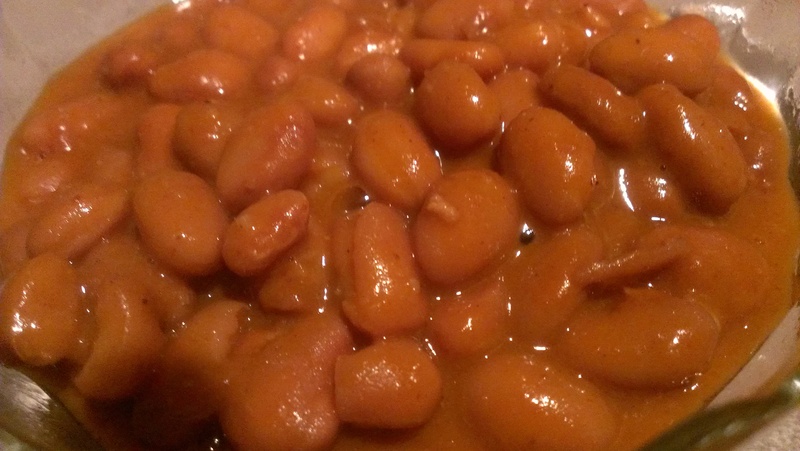 The reason why beans are considered “the magical fruit.” The more you eat, the more you toot. Tooting aside, I love beans! But Tara does not. This is what you’d call an honest-to-goodness conundrum. But she was game enough to go along and at least try a forkful. We barbecued hot dogs and had beans on the side. Beans ‘n franks, man. It’s a classic combo.